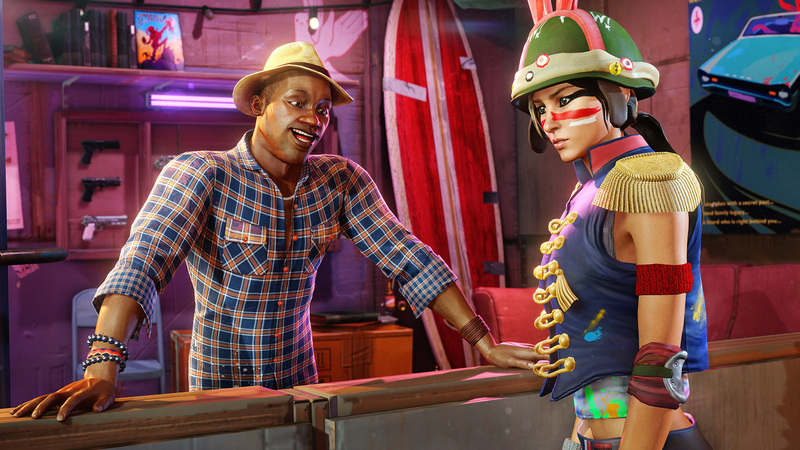 Welcome to Sunset City, where you the player (at one point when asked your name the reply is “it’s above my head in the multiplayer”) have just survived “horror night”. Horror night, as it has come to be known, is the night the Fizz Corporation (Fizzco) has just unveiled their new energy drink, Overcharge, at a concert where you happen to be working. All hell breaks loose when everyone (but you) begins consuming it and turning into hideous orange mutants bent on attacking and killing everyone they see. In no time they have taken over and Fizzco has quarantined the city and told everyone in the outside world that all inside are dead. You, of course, are not dead. Having taken refuge in your apartment and after seventeen days are finally forced out in to the world where you begin to meet an ever expanding group of survivors led by Walter, a grumpy old timer who works a bit like the father figure you clearly never had. From that point on your goal is to escape the overrun city and expose Fizzco for the apocalypse-bringing bastards they really are. Sunset City is broken down into four sections (though you can go anywhere right from the start): the harbor, downtown, little Tokyo, and your starting positing the old factory district. 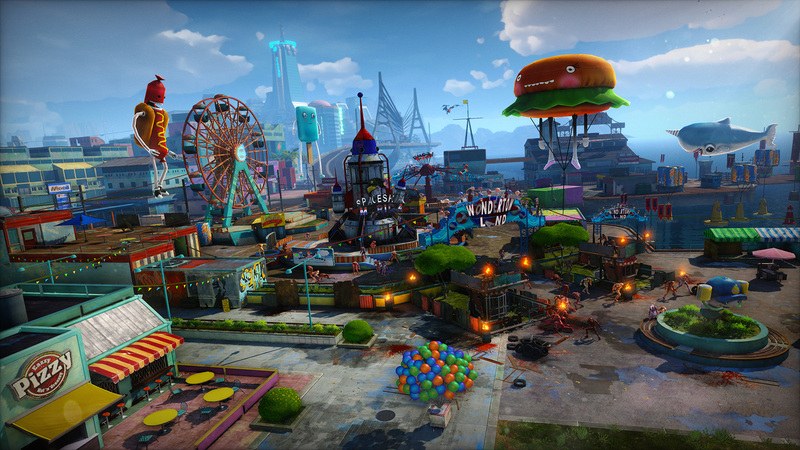 Each of these areas has a faction that you will need to befriend to get their assistance in escaping Sunset. You’ll start with “The Oxfords” a group of preppy ivy leaguers that Sam is desperate to impress. They don’t seem very worried about what’s happening throughout the city as they spend all day texting to each other despite being in the same room. You’ll need to cater to each one of these selfish elitists to procure their help in fixing a vehicle to escape the city; and what an amazing city Sunset is. 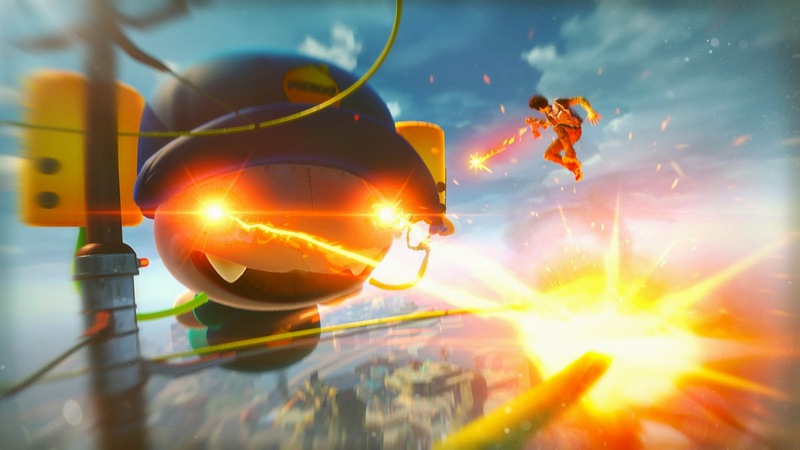 If you've seen any of the many trailers for this game you already know it’s a bright, colorful, open world game that has you jumping, grinding, bouncing, and swinging throughout the city. Insomniac wasn't kidding when they said you can go from one side of Sunset to the other without ever touching the ground. It’s an amazing world they've built where virtually everything can be used to traverse Sunset City. It’s a joy to move through; even more so when you unlock super bounce and air dash. Some have complained in previews that the movement should be faster but keep in mind that you will be killing hordes of enemies while doing all your parkour moves so after playing though the game in its entirety it feels just right to this reviewer. 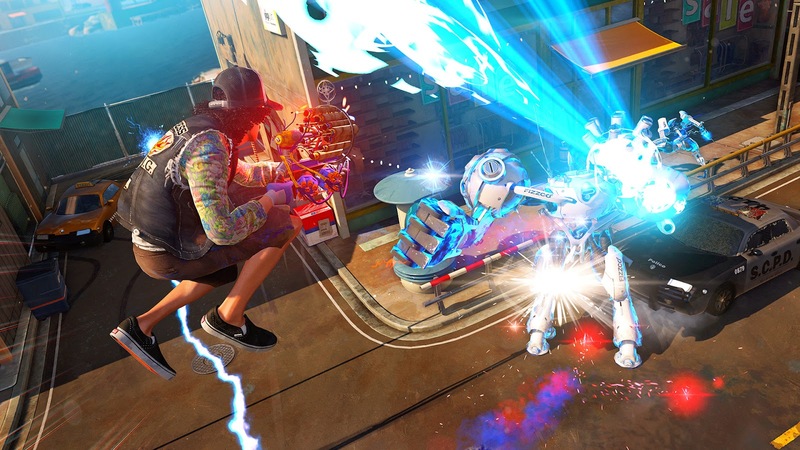 Sunset Overdrive does not want you on the ground, or standing still, and if you try it you will almost certainly die. There is only one difficulty, but enemies hit hard at all times, however they have terrible accuracy so if you stay on the move you’ll survive. The game gives you a high amount of aim assist for your weapons, but when you’re always on the run it becomes almost a necessity. Mixing up the types of moves and getting kills with flair build up your style meter, which triggers your amps. Amps are bonuses that improve your weapons and character. They’re a lot of fun and really add to the craziness of the game. There is a lot of joy in sending out tornadoes from a melee swing, or setting off explosions under your feet with each bounce you make. Or one of my personal favorites, having lightning bolts storm down from everywhere stunning and killing anything near you. That last one is an epic amp and justly so. k-i-t-t-y c-a-n-n-o-n. Basically you fire a kitty at a group of enemies and a dog goes after it, killing anyone in its attack radius. Then there’s grinding and bouncing atop a radio tower fighting a giant Fizzco mascot balloon, who’s firing lasers and trash talking you the whole time. It’s one of the amazing over the top boss fights from early in the game. The main story quests stay fun, fresh, and over the top all the way to end. One of the real stars of the game is the humor. There is a lot of great ‘breaking the fourth wall’ comedy in the game. As an achievement junkie its great to hear my character say, ”what an amazing view, and more importantly one step closer to a pointless achievement!”; or when a NPC is concerned you may die you reply, “no big deal I’ll just re-spawn over there”. That’s obviously just a couple of quick one-liners but there are many wonderful conversations between characters and a good amount of situational comedy as well. Of course with all the good comes some bad and that lies within the side quests. They’re just a boring bunch of fetch quests and killing random groups of baddies that are only there to pad out the length of the game, and not in a good way. There is nothing fun about going up to a NPC and being asked to retrieve five comic books, then returning and being asked to find five more, then returning yet again only be asked to get ten more to finish the task. It’s just tedious nonsense lacking imagination in a game otherwise full of it. That said, there are a decent amount of rewards you get for doing theses tasks such as money, weapons, and achievements. The other two things that are there to pad the game are challenges; which are basically just mini games where you try to get a high score and include leaderboards. Then there’s the seemingly never ending groups of collectibles in the game. Normally I would hate this type of thing but I have a soft spot for games that actually have collectibles that serve a purpose. There are hundreds of shoes, signs, toilet paper, balloons, etc. that all work as currency in the game for buying amps from Floyd. I've never understood why more game don’t do this. Lastly, this brings us to the eight player co-op multiplayer of the game known as ‘Chaos Squads’. It’s a surprisingly fun addition to the game where after choosing the area of the city you want to play in, you and your team engage in a series of mini games that culminate in a giant base defense. You are given a choice of two mini games to vote on each round. Two of which include delivering bombs to points on a highway, and returning fizzy mascot balloons to your base while the floor is covered in lava. Each mini game gives you points and adds chaos percentage to the base defense; the higher the chaos the more intense the defense is. So your voting does matter beyond just which mini game you prefer as one mini game may have more chaos than the other. The base defense is the best and craziest part as you and your cohorts hold the line against literally hundreds of enemies at once. With the amount of players, enemies and explosions going on in close proximity all around you, it’s a wonder that there is never any lag or frame drops. All in all, it’s a solid addition to the game though I doubt most people would spend more than about ten hours in it before they've had their fill. So did it live up the hype? Over all I would say a resounding YES! 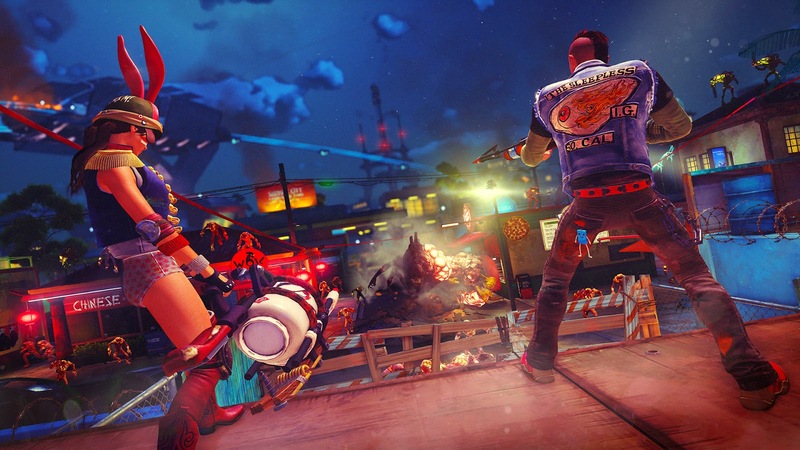 With an amazingly crafted world and great laughs abounding in every scene my only reservation are the unimaginative side quests, but with them being only a small portion of the game its only a minor knock on Sunset Overdrive. I recommend everyone play this holiday gem as soon as possible and here’s hoping for an even better sequel. What I played: Completed the story, all side missions, all collectibles, and achieved a gold medal on all challenges. When The Evil Within was first announced I was very excited. I never got to experience Resident Evil when it was new. In fact I still haven’t played it. I never got to experience the horror that everyone else talks about so highly, I was too busy playing Zelda and Mario. So the prospect of history repeating itself but this time me being a part of the experience was very exciting to me. Survival horror games is a genre that I never touched before Xbox 360. Dead Space pretty much was my entry point into the genre and I loved it. They are scary but at the same time don’t have the look of reality to them like movies do (I hate horror movies, I’m a wimp). Anyway, games like Dead Space (1 and 2), Outlast and most recently Alien have given me the thrill of the horror without me having nightmares afterwards. So with The Evil Within being made by Shinji Mikami, the man behind the aforementioned Resident Evil, I was very excited to experience what people have raved about for as long as I have been a gamer. Going into a game with that amount of hype and expectation can be a very bad thing and The Evil Within unfortunately had that weight on it’s shoulders from me. I started the game up and it instantly gave me a huge issue. Letterbox mode. Having thick black borders at the top and bottom of my screen irritated me for a long time. It took me until around half way through the game to finally get used it. But to begin with it felt like I couldn't see anything and with the camera being very close to the character it felt very restrictive. Letterbox aside the game started strongly. The first chapter opened up many questions in the story and had you creeping around unarmed while a hulking maniac with a chainsaw hunts you down. The dark setting and music was nailing the atmosphere. Unfortunately once the chapter cleared screen appears that’s pretty much the end of any horror or suspense. From then onward the game as a survival horror game goes downhill very rapidly. By chapter 6 you are running around in broad daylight fighting hordes of monsters, which is not scary in the least. Horror does peek its head around the door during the chapter in the mansion. When Ruvik appears and you have no choice but to run it is a fairly nerve racking ordeal. However this is the only other part of the entire game that has the traits of true horror. There is plenty of jump scares throughout the game but nothing that captures the tension of what a true horror game is about. Don’t get me wrong, the survival aspects succeed where the horror fails. With ammo conservation being something that sticks in the front of your mind for the duration of the game. Many times I was out of ammo and ended up desperately scouting around for more lead to pump into my foes. The game also features a fairly limited crafting system in which you can craft various types of bolts for your crossbow. You can find the material to do so either lying around or by disarming the numerous traps that are placed around in an attempt to ruin your day. The process of disarming said traps is mostly an easy affair. For thing’s like bear traps and trip wires it’s simply a case of creeping up to them and holding down a button. However the proximity bombs are a huge nuisance. It presents you with a clock-like dial, most of which is red with a small section of blue. The goal is to get the needle to stop in the blue section, however you only get one shot. Once the needle goes around once the bomb will blow up. On top of that it seemed to me that it wasn't quite in sync. It felt very much like I had to press the button before the blue section to get it to stop there. Which caused many a bomb blowing up in my face for a very long time. Much like the letterbox it’s a case of getting used to it. Without any upgrades the gunplay is also a fairly frustrating affair. Countless times I would have my cross-hair dead on an enemy’s head and it would miss. Which in a game where ammo is scarce it’s a problem. So spending your green gel on accuracy upgrades early on is a must. Also melee combat might as well not exist. By the end of the game I had my melee damage upgraded to the maximum level which gives you 200% damage and I could still not come close to killing a monster in a 1 on 1 fight. However taking the stealth approach where possible leads to some easy instant kills with a knife to the cranium. Once you get the upgrades the game gets a lot more enjoyable. Being able to nail critical head shots is a very satisfying feat. The sound of it is also equally satisfying. Unlike most other games, shooting the legs is also a very effective tactic. Doing so will make most enemies fall face first into the dirt (or blood in most cases) and then you are able to drop a match on them for a instantaneous kill. Matches are surprisingly useful in the game. If you can get a group with one on the floor then a single match can cause the entire group to be set ablaze. The question that has loomed since the game’s announcement was “how does The Evil Within compares to Resident Evil?”. The answer is: very much so. The game plays almost exactly like Resident Evil 4. Whether it be small things like the way the camera is when you open a cabinet or the big things like the gunplay. 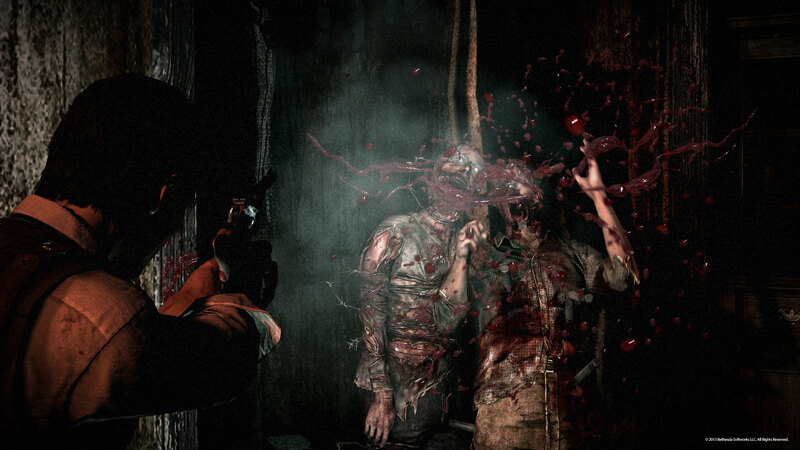 The Evil Within very much feels like a sequel to Resident Evil 4. The look of the game however is a lot more like Silent Hill. With blood dripping from walls and grotesque boss fights it LOOKS like it would be right at home in the Silent Hill catalog. Enemies in the game would also look right at home in Silent Hill. Ranging from the standard man with a giant nail through his head to a fat man with a chainsaw, the enemies in The Evil Within are a sickening sight. Most of the enemies are very easy to deal with and a couple bullets in their dome will see them not bother you again. However there is an enemy type that drove me insane. These enemies were invisible. You can see a shimmer if you look really closely but I could never see it until it was much too late. In the end I ended up just shooting blindly hoping I would hit them. Thankfully only a handful of these abominations exist in the game. Other enemies that are severely annoying are the ones that carry guns. They don’t hesitate in shooting at you with their seemingly infinite ammo. Maybe it’s just me but I really don’t think this kind of game should have enemies packing heat. The ones with slow rate of fire weapons like the sawed off shotgun are bearable but when you get to the ones that are touting fully automatic weapons, it feels very unfair. Some of them even carry the same crossbow as you and will stick explosive bolts to you. These types of enemies I feel will be your biggest threat on Akumu difficulty (more on that below). On the subject of guns there is a very laughable section of the game in chapter 12 that has you sitting on a mounted machine gun with no ammo limit or overheating to worry about. You then proceed to just mow down groups of enemies. This section right here is the single worst section of the game. I should never in this style of game be laughing out loud and this section I found myself doing so. Bosses in the game are a very mixed bag. Some are fairly enjoyable to fight but some are just downright annoying. The one that sticks out to me in the latter department is the fight with the giant mutated dog. He likes to sit in bushes and just jump out at you. The lack of a dodge button is made very obvious throughout this fight and it caused me a great level of frustration. The two fights with Laura on the other hand were pretty well thought out fights in which you had to use more strategy than just dumping whatever you have into her. Baiting her around into various traps was a nice change of pace from the rest of the game. Unfortunately the final boss is nothing more than a glorified quick time event. Story wise the game is pretty much left up to the players imagination. For 14 of the 15 chapters chances are you will have no clue what is going on. The final chapter of the game gives you just enough to piece together something for yourself, but there will be a lot of differing opinions on what actually did happen. I have my own theory but that could change with subsequent playthroughs of the game. I reckon the story will leave the audience very much split as to whether it is actually any good. Personally I thought it was pretty good. I don’t want to spoil the story for any potential players out there so I will leave it at that. After having my brain well and truly twisted by the first playthrough of the game I jumped straight into the game’s daunting Akumu difficulty. On Akumu, one hit and it is all over. Anything from a flying axe to splash damage from your own grenade. This difficulty is not for the faint of heart. If you do decide the take the challenge, it is a very rewarding experience. You will die. You will get frustrated. But this difficulty not only gives you a sense of reward with each checkpoint, it also gives the game a sense of terror that the Survival difficulty was lacking. I have only played the first 5 chapters on this setting but so far it is a definite strong point of the game. The achievements in the game are a very solid list. There’s only a handful of story related achievements. The rest are mostly secondary objectives to complete within a specific chapters. There are collectible achievements within the game but most of them don’t seem to bad to get and they also carry over to New Game +. The 2 big challenges within the list are found within beating the game on Akumu difficulty and beating it in under 5 hours. Both of these will take some practice and perseverance to achieve. The Evil Within is a very good Action Survival game. Blending aspects of both Resident Evil and Silent Hill to form a solid game that should provide you with 19+ hours of entertainment and that’s if you just want one playthrough! Upon beating it you will unlock higher difficulties, weapons and a new game + option to sink your teeth into. So look no further if those are things you are looking for. If, however, you are looking for a deeply terrifying survival horror game then look elsewhere because there is barely any horror to be found here. Did it live up to my expectations? No, but it is far from being a bad game. What I Played: Completed the game on Survival difficulty in 19:11:51 with 113 deaths and the first 5 chapters on Akumu difficulty. I should probably mention right now that the only Alien movies I have seen are Alien and Prometheus. So it should go without saying that I am not part of the huge following that the series has. I was skeptical when Isolation was announced. More than skeptical in fact. Many of my friends will probably remember me blowing that game off from the second I saw the headline and I’m sure you can guess why! I could see no way in which I could do a review on this game without addressing that train wreck. It’s what was on my mind when the game was announced and I’m sure I was not alone. 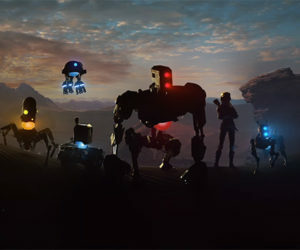 However, if you can just push past the thought of that game and give the Alien video game series another chance, you will be pleasantly surprised. Isolation and Colonial Marines are NOTHING alike. Sure they share the same title and universe but that is where the comparisons end. It would be like comparing Mario 64 to Mario Kart. Isolation puts you in the shoes of Amanda Ripley, the daughter of the movies heroine Ellen Ripley, as she attempts to find out what happened to her mother aboard the Nostromo. The game sets up with Amanda doing her job as an engineer when she is told that the Nostromo’s flight recorder has been found aboard another ship, the Sevestapol, and she joins the crew on a mission to retrieve it in hopes of getting closure on the fate of her mother. From a gameplay standpoint Isolation is very much a stealth game. If you get caught by the Alien you are about to have a really bad time as one touch from the titular creature will instantly put you back at your last save phone, which can sometimes be further back than you realize. So your best bet is trying to get around the enemies without so much as a peep which is much easier said then done! With Androids, Aliens, Facehuggers and even fellow humans out to get you it’s a very stressful experience. The first half of the game is truly terrifying. With the constant threat of being a blink away from being the Alien’s next victim, the tension reaches heights that not many games have ever managed. The sound is superb at making sure you don’t relax for even a second too, whether it be the intense music or just the banging in the vents getting louder and louder. With that being said once you get the flamethrower at around chapter 10 all sense of dread is abolished as you no longer have anything to fear from the alien. Couple of squirts in his face and he’s a cowering mess, retreating into the nearest vent. You can still get the occasional jump scare from him getting behind you without you realizing, but the tense feeling you have felt for the entirety of the first half of the game, is very much dead. The game also features crafting which I feel is not as important as it should have been. I spent most the game using not much more than the odd med kit. I used a couple noisemakers here and there to move the enemies away from the path that I wanted and I used a couple pipe bombs to get rid of a few pesky androids but other than that I used none of the selection of items available to me. They seem very much like they are not meant for the stealth play style that the game almost forces upon you. Weapons in the game seem almost useless too. Aside from the flamethrower (which like i said earlier pretty much breaks the game) the other weapons are extremely feeble and not worth giving up your position to use. By the end of the game you will have got the chance to use a revolver, a shotgun, a stun baton, a flamethrower and a bolt gun. I will say the bolt gun is extremely effective at taking out androids if you need to, but you get it very late in the game and ammo for it is far from plentiful so you can’t just slaughter all androids in your path, which is a good thing, this isn't a run and gun shooter! Graphically the game looks great. It really nails the effect of a futuristic space station from the point of view of the 1980’s! The high point for me is the couple of spacewalks you do. Standing outside looking at the station, sun and planet around you really is breathtaking. I don’t very often in video games stop to enjoy the scenery but those moments in Isolation I sure did. I haven’t spoken very much about the other kinds of enemies outside of the unkillable alien. As I was playing with a pure stealth play style I didn't engage in combat a whole lot. I didn't kill a human my entire playthrough and only a handful of androids felt my wrath. The androids are menacing. They are strong and if they get a hold of you your health will drop fast while you mash the prompted button to break free. Aside from the aforementioned bolt gun, which one well placed headshot with it would immobilize them, expect to use most of your ammo just trying to take out one android. Facehuggers, much like the alien, will instantly kill you if they touch you and with the size it can be challenging to get them before they do. However you will never see them without your trusty flamethrower in your inventory so if you can spot them you can fry them with one quick burst. You can also easily tell one is coming for you from the screeching sound they make. As I have said, the game is very heavily based on you being sneaky and not causing a ruckus, so when the game threw a section at me in which I had no choice but to fight toe to toe with 5+ androids I wasn’t too happy. The combat and gunplay in the game is not that great, but it didn’t matter anywhere else in the game so long as you stuck to the shadows. This section though, which only lasted a couple of minutes, felt like it was put in just so you could try out the different weapons and craftable items. It is by the far the lowest point in the game and from what I could tell had no bearing on the story so could have easily been cut. Speaking of story, the story here seems very solid. Like i said earlier I’m not a huge Alien guy so there could be some problems with it tying into the movies but on it’s own Isolation stands it’s ground in the survival horror genre. For the people who want to flesh out the story there are 151 archive logs to read and listen to from various crew members that were aboard the Sevestapol prior to the incident. There are also 10 Nostromo logs to find but I am unsure if they are to do with the movies or the game. Hopefully they are a service for the people who are Alien fans. The games length is both a strength and a weakness. It took me somewhere between 18-22 hours to beat the game on the recommended Hard difficulty setting. Which is 3-4 times longer than most games are nowadays. But i couldn’t help but feel some of the objectives were being deliberately drug out to achieve a longer playtime. Multiple times the game will have you go to point A then come all the way back again to do something and then go back to point A again. Also you will feel like you are seeing the same places again. That’s because you are, the game will send you in circles a fair few times, usually to access that one door you saw earlier that you didn’t have the equipment for. 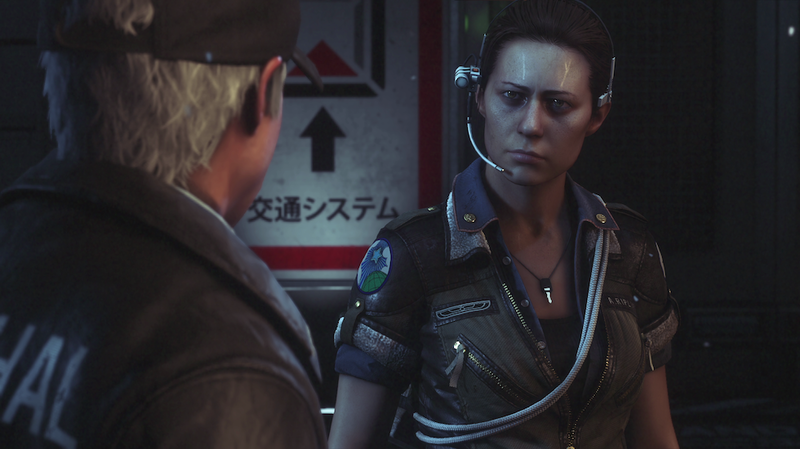 In short Alien Isolation is the Alien game that FINALLY managed to capture the look, feel and sound of the movies. With a lengthy 18+ hour campaign that will terrify the pants off you for at least the first half it is an incredible game that is definitely worth your attention. Creative Assembly have shown that RTS isn’t the only genre they can master and I hope SEGA continue to use them going forward in the franchise. What I Played: Completed the story on Hard difficulty.